My next book out for Pathfinder is now out! Legends say that witches keep their spells inscribed into a Book of Shadows that holds their accumulated wisdom and power. Here, in Strange Brew: Book of Shadows, you’ll find magic drawn from real-world legends, mythology, and folktales, as well as pure flights of fancy. 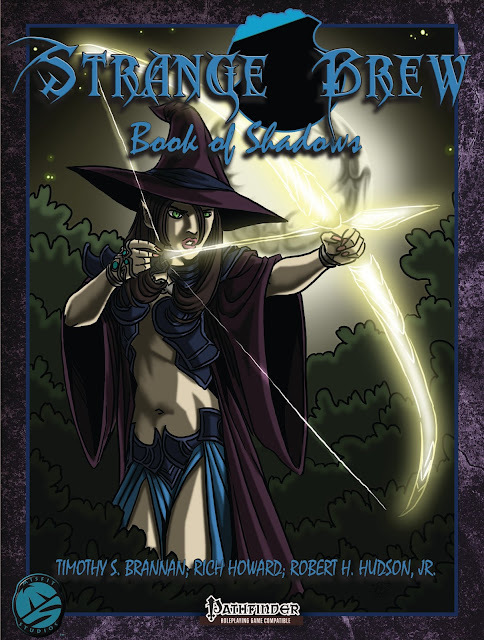 Within Strange Brew: Books of Shadows, you will find over 100 spells and a half-dozen rituals, enough to delight your characters, bedevil your foes, and make your witch (or other spellcaster, whether arcane or divine) a formidable opponent. All for your Pathfinder Role-Playing Game! Again. Special thanks to +Rich Howard and +Robert Hudson for helping me get this together. And of course my editor/publisher +Christina Stiles The cover art is by +Jacob Blackmon, whom I have featured here many times. Haven't really gotten "into" Pathfinder, but this sounds like it's worth a look. Thanks!